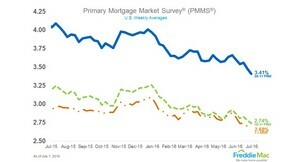 MCLEAN, VA--(Marketwired - Jul 7, 2016) - Freddie Mac (OTCQB: FMCC) today released the results of its Primary Mortgage Market Survey® (PMMS®), showing average fixed mortgage rates dropping further to new 2016 lows in the wake of the Brexit vote. At 3.41 percent, the 30-year fixed-rate mortgage is just 10 basis points from its November 2012 all-time record low of 3.31 percent. "Continuing fallout from the Brexit vote drove Treasury yields lower again this week. The 30-year fixed-rate mortgage followed Treasury yields, falling 7 basis points to 3.41 percent in this week's survey. Mortgage rates have now dropped 15 basis points over the past two weeks, leaving them only 10 basis points above the all-time low."